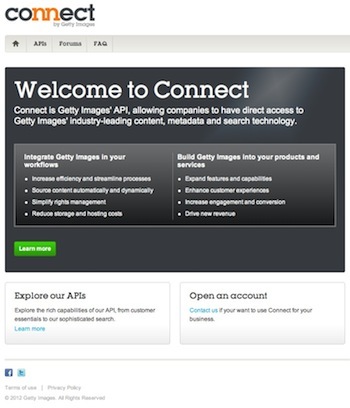 Getty Images has just launched Connect, a new way for web properties to easily integrate all of Getty’s image archive plus extra functionality like metadata searches in their sites via an API. Getty Images is getting with the 21st century today. With its new Connect system, Getty is making it easier for web publishers and certain platforms like blogging tools to embed Getty’s image products in their online publications than it may have been before. This is clever, definitely designed to boost revenues, and probably overdue. 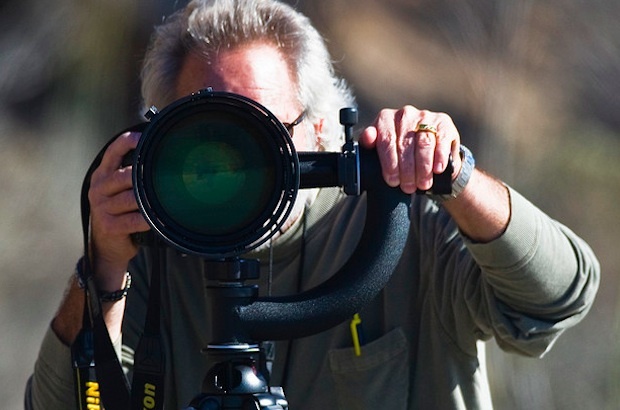 We spoke with Getty’s SVP of Business Development Craig Peters to get a fuller explanation. “What Connect is announcing for the first time is that we’re exposing our technology, our metadata, and our content to our customers–letting them have direct access to all that through our API and web service for the first time,” Peters says, while illustrating a couple of different use cases: A content publisher who could embed Getty’s API in its CMS so that its own users could easily get access to Getty’s high-quality images, or a content provider something like IMBD which could now access Getty photos of movie stars in a more automated way, or a publisher that supplies automated galleries. Zazzle, LoveFilm, Facebook advertising partners, Weebly, and Reach Local were all examples of who may be clients for this service. This is also a move to entice online publications away from using other sources of imagery for their products–everything from blogs to adverts to business-promotional pages and so on. We’re talking about services where creative commons licenses permit sites like Fast Company to use images, perhaps user-submitted ones, to illustrate or decorate their content. Getty has over 60 million high-quality images of all sorts in its archives, accurately labeled and tagged, and would obviously like folks to use its images rather than anyone else’s, for a small fee. The company has long had a web-based mechanism for allowing use of the images, but it required a pretty manual manuever by the interested parties, whereby you had to go to Getty, find a relevant image, pay for it, grab the code to link it into your webpage, and then paste it in. Every step like this is a potential barrier for frequent use of a Getty image instead of one from a different source–particularly if the different source is free. Getty of course prides itself on the quality of the images it offers–and in many cases it’s possible to find a more fitting or beautiful image within Getty’s stable than elsewhere. But why go through all these steps to use a Getty image, and pay for it, rather than choosing a free image? So Getty’s now trying to add value to its process. By allowing firms like blog publishers to embed its code in the blog submission page of their CMS, Getty’s making it technically easier for bloggers to chose a Getty image. And there’s a definite bonus in the way Getty’s Connect code suggests images dynamically–its engine poring over what you write and then quickly matching your words to its heavily meta-tagged photo archive. That’s a nice trick, and could be much more satisfying than typing keywords into Google, trawling through images that have the right permissions, and choosing one that approximately matches your needs. Skeptics will say that there’s nothing revolutionary here, and that Getty should have done it a long time ago–the API isn’t spectacularly original technically, and you may have imagined that Getty should’ve tried to keep up with the vogue of online image use in order to keep its revenue streams healthy. After all, online publishing is changing everything from newspapers to magazines to advertising to TV, and has been for years. But instead of trying to keep up with the leading edge, Getty in the past has chosen aggressive and arguably backwards measures. You could see its past approcah as a kind of digital NIMBYism that saw the firm trying to pursue small firms or individuals with punitive fines for abuse of its IP and even trying to half-assedly adjust the “fair use” behavior of the web by scanning millions of sites with PicScout software (a firm Getty bought in 2011) and sending threatening letters to people who are using Getty images, even if they’re unaware it was infringing. Just Google “Getty Images lawsuit” to see what I’m talking about. And now with Connect Getty has “a way that makes it easier for people to consume the imagery in the proper way, with the right rights and have a formal relationship that allows them to build businesses and build services and integrate imagery.” It’s a good thing for the business, for the copyright owners, and ultimately the photographers, Peters points out, and makes everything easier and more relevant.